They paraded Friday along Comet Drive — flanked by construction of the school district’s new bus barn to their left, and to their right churned dirt pushed behind the concrete curb during the drive’s construction. Like the class, the campus remains a work in progress with high expectations. The procession was led through the high school parking lot by students carrying a white banner before them. It was emblazoned with “Class of 2021” and was signed by all class members. The outgoing eighth graders entered the front door of the high school and circled around tables filled by their parents as high school associate principal Larry Wolfe hung the banner in the commons area. It will hang in the commons for four years and will be at their graduation ceremony, Wolfe said. It was the first crossing over ceremony since the opening last fall of the new middle school addition on the high school campus. The ceremony began in the new competition gym where students picked up awards for their efforts in the 2016-17 school year. Then their teachers spoke, praising them for all they have done this year, and encouraging them to be involved in high school activities. Wolfe and four current high school students picked up that theme urging being active and emphasizing the high school is a close-knit community whose members help one another. Gable reminded the eighth graders that he asked them as the school year began how well they would lead. Eighth-grade teacher Ryan Rahmiller congratulates the outgoing eighth-graders for the great things they accomplished this past school year. Charles City High School associate principal Larry Wolfe leads theClass of 2021 in three rounds of the “We Are CC” cheer. The Charles City Class of 2021 begins its march to the front doors of the high school on Friday. 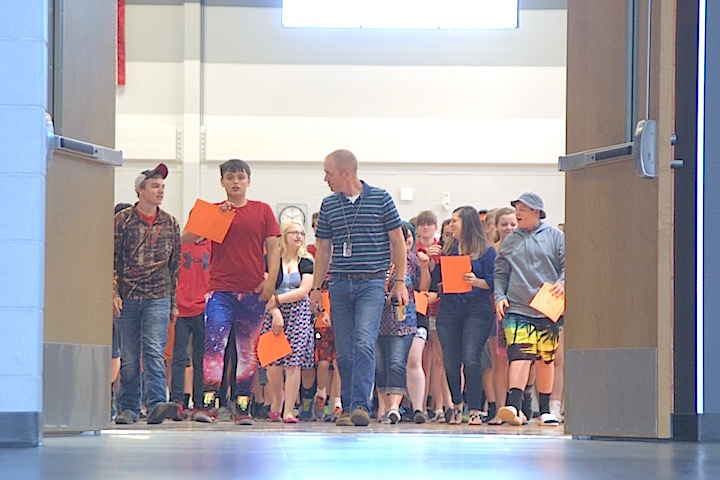 The Charles City Class of 2021 marches to the front doors of the high school on Friday. The Charles City Class of 2021 enters the front doors of the high school on Friday. Charles City High School associate principal Larry Wolfe hangs the Class of 2021 banner in the high school commons Friday morning. This entry was posted in Charles City Schools and tagged Charles City Middle School. Bookmark the permalink.